If you are here before 12:00 A.M. Mountain time, on March 24, please note that this blog has published too early. I blame it on blogger's brain malfunction. Counterfeit Kit Challenge is more than just a kit building club. Each month, CKC also posts challenges and tutorials. The later are to prompt us to further our counterfeiting by creating embellishments and papers in the vein of the originals. Lots of clever ideas are shared. The challenges are to jump start our creativity or to give a gentle push into creative realms previously unexplored. #3 Be inspired by what's on you desk. I fell in love with the layouts of the design team members in challenge #1. Especially Susan's. This was her submission. I love the airy feel of her layout and the fresh colours in the sequins. Most of all, I like the idea of getting to use lots of die cuts on a layout, without it looking like the cat sneezed on my desk. You may not know this about me, but I struggle to leave white space on a layout. ("Oh look! A space for more embellies!!" ) so my version is a bit a lot heavier. My brother's family Christmas card usually is scrapped into a Christmas album. But this time, it will be going into my Family album. A little background. Ed traveled extensively in his single years. But he met his wife in his own back yard. She had traveled from the Philippians. How ironic. Long story short. They are living the "happily ever after." Absolutely gorgeous love all the tiny elements! Brilliant layout, so much detail! A great scraplift - and what a lovely backstory to the page! 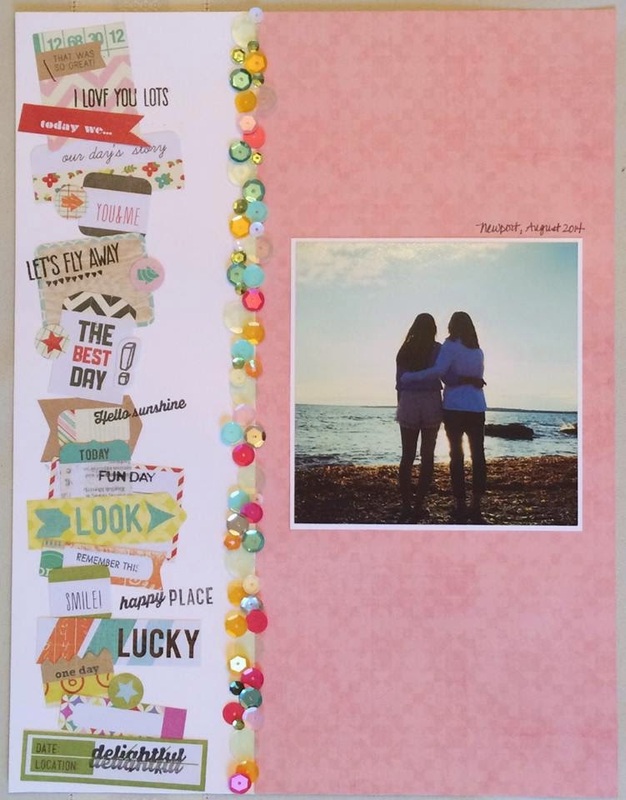 You have such a fun arrangement of travel bits and pieces cascading down your page for a terrific border craze! Love the strip of gems and buttons especially! Enjoyed reading about your brother's life too! Phillipians? I love your take on this layout, very colourful. Lovely lift-and you have both inspired me! I may have to lift you both! Lovely page, you and Susan make me want to have another go at it! Fabulous layout! You have the opposite issue to me - I struggle to fill the space. I add embellishments and then think 'no, less is more'. Thanks for the inspiration to try adding extras for a 'more is more' look! Nice job.. I like the heavier embellishments. Thanks for lifting me! I really like your version - the border section looks very rich and I also like the way you varied the sizes of the embellishments on the left. Great layout! Hehe, heavier maybe but still an awesome layout! Beautiful bright and fun layout.